Home » G2 » Did you know the G2 control is used to create a popular line of tattoo machines? Did you know the G2 control is used to create a popular line of tattoo machines? 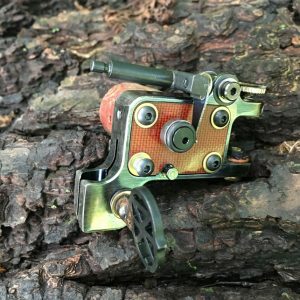 Well known in his industry, Dan Kubin is making unique tattoo machines that sell out typically within the same day he posts them on his website each Wednesday. “I make and sell multiple models of tattoo machines, making about 50 week right now, and still have a hard time keeping up with the demand,” explained Kubin. 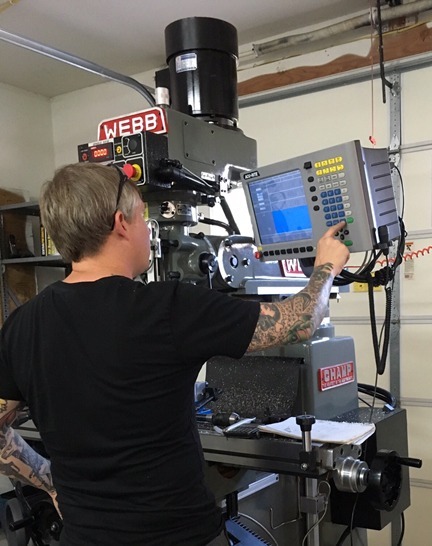 “A couple of months ago, I purchased a Webb milling machine with an ACU-RITE MILLPWR G2 control on it from a HEIDENHAIN / ACU-RITE distributor — Accurate Measurement Systems (AMS) in St. Louis — so that I can more efficiently work on these projects.” Kubin is located in Independence, MO. To many, Kubin’s tattoo machines are reminiscent of the Steam Punk style which embodies futuristic characteristics of an industrial era, often utilizing bright brass and copper. “If it is Steam Punk, that is unintentional. All I can say is that I like this look, as well as the use of brightly colored finishes, and working with brass and copper,” added Kubin who is also a practicing tattoo artist having done both for many years. Kubin started his interest with the tattoo business around 2005 during his time in the Air Force where he served as a machinist and welder. Until recently, Kubin has been designing and developing his tattoo machines manually, then outsourcing the machining. He explained that since he has so many different machine designs with much custom work, and that they keep changing, it had become very frustrating for all involved to keep up with his evolving creativity. “So I finally decided to buy my own milling machine in order to develop my new parts exactly the way I want them, when I want them,” explained Kubin. Kubin visited AMS in St. Louis and decided to buy their new demo machine right off the floor. “It blew me away,” added Kubin. “This machine with the G2 control allows me to do all kinds of things right in my home shop. With it now, I use it for rapid prototyping. I have the two-axis version so I am able to develop any crazy idea I have just by drawing something up in CAD and uploading a DXF file. I then tell it how deep I want to cut it, and move. I’ve been making all kinds of cool stuff! There are multiple features on Kubin’s new machine with the G2 that Kubin likes best, including the fact that there is a W axis as well as X, Y and Z. This allows him to move his knee up and down manipulating the W axis, and his 0 never changes. The control compensates for that, and nothing needs to be re-set.